Violet Coloured Contact Lenses Range are a range of coloured contact lenses, which are a vivid violet colour. 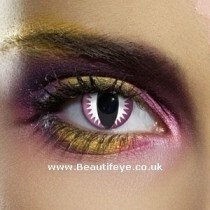 These coloured contact lenses will give you a truly unique and unusual look- perfect for making a real fashion statement! In this range, you will find a huge array of coloured contact lenses, from UV coloured contact lenses, to wacky designed coloured contact lenses- the choices are endless!